Valuable learning often takes place through informal learning. 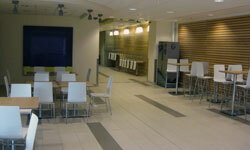 The campus has a variety of informal learning and social spaces scattered around campus, indoors and out. 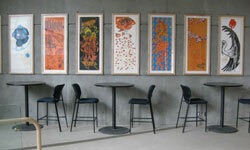 This space is organic in the sense that it is self organized and does not need to be booked. View the Informal Learning Space Map for some of the best finds as recommended by students. 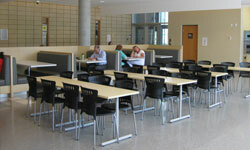 During the evenings and weekends the Sunroom and Cafeteria is a great place for students to meet and study. 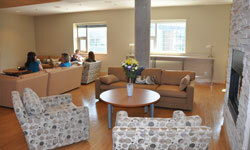 Mon-Thurs 8:00 am – 11:00 pm, Fri 8:00 am – 9:00 pm and weekends 10 am – 7:00 pm. Hours are subject to change during the holidays. Thanks for visiting our website! Your feedback is important to us. Website Feedback Form Your comments will help us ensure that we're meeting your needs.